KellyJane first started making costumes for herself and others in 2005 for university events, her first "from-scratch" costume being from the fanseries "Mighty Moshing Emo Rangers" for a superheroes night! From there, she discovered the UK cosplay scene via a Naruto screening held in London in 2007, and has been obsessed with costuming ever since. 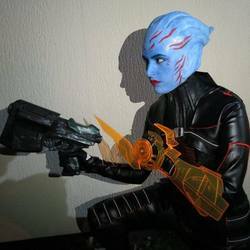 As well as cosplaying from anime and video games, she is also actively involved in sci-fi costuming, and is part of a UK costuming group that brings together screen-accurate costumers to raise money for charity. Having left university early, she works full-time and has done so for several years. Along with the expensive hobby of costuming, the rest of her paycheck seems to go solely on conventions, Nandos, and Diet Coke. She is the other half of TealPirate, older sister of Sora1992 (known as Saix of "Demyx Time") and is often the one who beats the rest of Parléroductions into line.